One of the constant challenges as a parent is dealing with lack of sleep due to your child's sleeping patterns. Little LadyBug (LL) is like most children that has phases of sleeping through the night until 7:00 am but then there are times when she wakes at 5:00 am for snuggles. 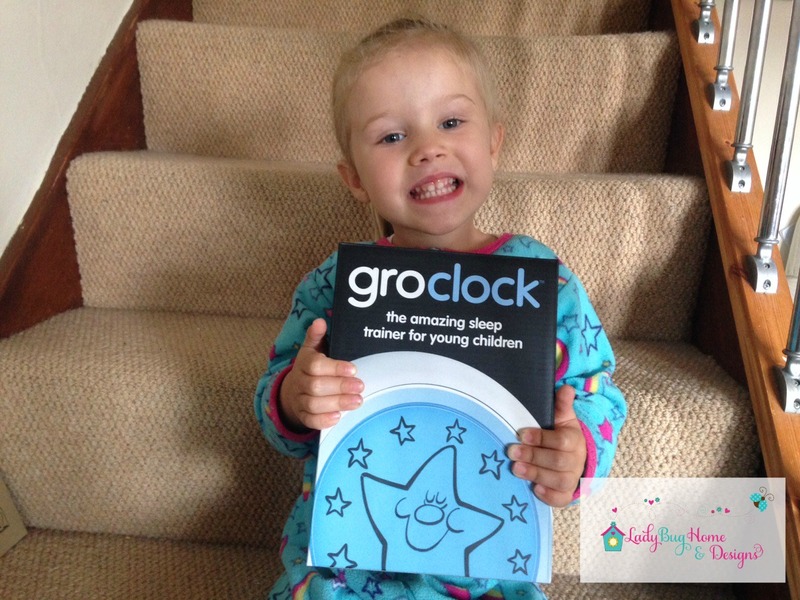 Now that LL is 3 1/2 years old (almost 4), she is still a fairly good sleeper but I was very interested in learning more about the Gro-Clock by The Gro Company. The Gro-Clock is a clock designed as a sleep trainer to help children understand the concept of when it time to go back to sleep and when it is time to wake up. The clock is designed with a yellow sun face that indicates when it is awake time and a blue moon face to indicate when it is sleep time. You set the ideal "wake up" time and then at bedtime with press of a button the sun disappears and the moon appears surrounded by stars. The stars disappear as the time gets closer to the set "wake up" time. The idea is to teach your child that if they wake up in the middle of the night and see the moon with stars that they should stay in bed and go back to sleep. If they wake and the sun has appeared, they can get up out of bed. 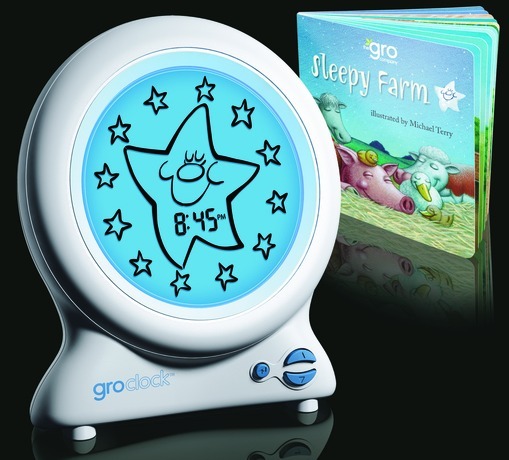 The clock also comes with an illustrated book that tells a bedtime story about sleepy farm animals to encourage your child to sleep until the sun appears. The current clock has option to display the digital time which is a great way to teach your child about time. The brightness of the display can be adjusted and it is durable light-weight plastic. It is the perfect size to be able to read time on clock from across the room but not too big. There is also a "nap-time" mode and audible alarm. My daughter is currently sleeping consistently though the night until 7:00 am but we are using the clock to teach her about concept of time. Through the year as the night and daylight hours vary, this clock will be very handy to teach my daughter to read a digital clock to distinguish bedtime but also a tool to maintain consistent sleep patterns. Another alternative of way to use this clock is as a travel clock. Often when we stay in a cottage or hotel around the UK, my children wake earlier than normal but also useful as a night-light in dark unfamiliar bedrooms. In all honesty, my only product "wish feature" would be it was battery-operated. The clock is designed to be plugged into the mains. I am sure that The Gro Company have considered this option but I personally would love the ability to move the clock around the room. I have a little concern with putting it on her bedside table and getting tangled it in during the night. I would highly recommend this clock. It is product that we will continue use with my daughter and son in the future for sleep training. 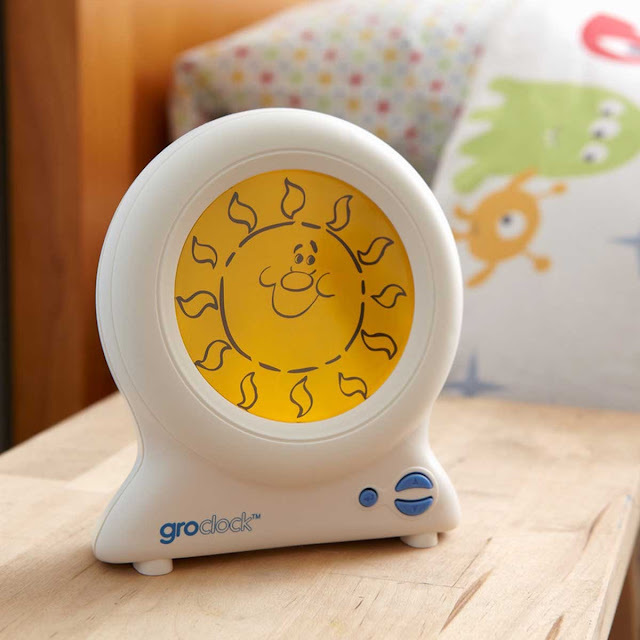 Thank you The Gro Company for providing me with a Gro-Clock to review and images.